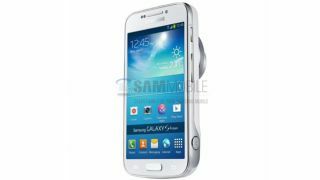 The first snap of the rumoured Samsung Galaxy S4 Zoom cameraphone has reportedly emerged online, ahead of the company's mobile event in London on June 20. The seemingly well-connected SamMobile site has received a photo of the purported device that, as we'd been led to believe, looks like a compact camera spliced in half and glued to the back of a Galaxy S4. The hybrid device is thought to be the follow up to last year's Samsung Galaxy Camera with the added bonus of being able to make phone calls and utilise the entire cellular functionality of a smartphone. It's said to be packing Android Jelly Bean, sitting beneath Samsung's own TouchWiz UI, while a 1.6GHz dual-core processor is rumoured to be powering the device and its 4.3-inch display. Like the Galaxy Camera, which impressed our reviewers upon launch in 2012, the Galaxy S4 Zoom is thought to pack a 16-megapixel sensor with, like the names suggests, a decent sized optical zoom. The report claims this'll be the last of the Galaxy S4-branded devices when it arrives, following the recent launch of the Galaxy S4 Mini and the Galaxy S4 Active. The Korean giant is holding a launch event in London in less than two weeks where the Galaxy S4 Zoom could conceivably make its debut. Do you think the pic is genuine? Let us know in the comments section below.